Apart from being an aviation hobby shop, Flash Aviation also occasionally publishes some books or is deeply involved in the editorial part. 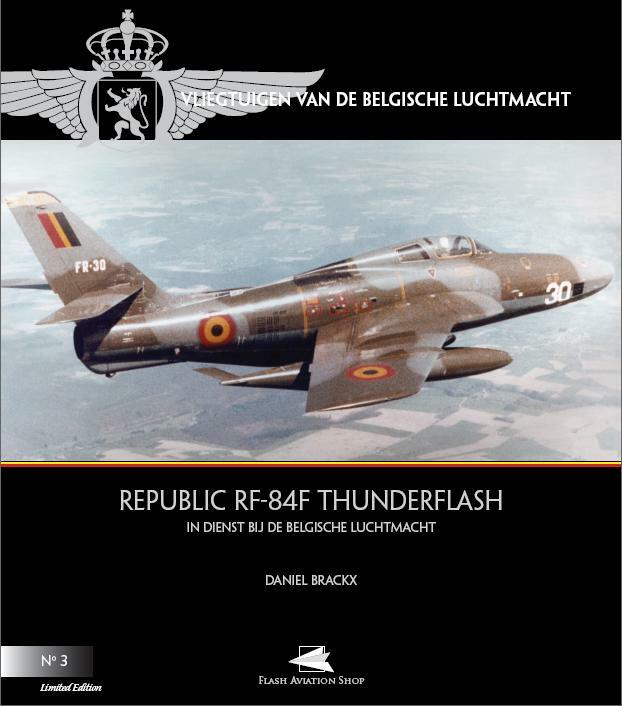 A listing can be found here..
(BS200027) Designed specifically for the reconnaissance task, the Thunderflash was intensively used by the Belgian Air Force. They even had an Iron-curtain incident when a Thunderflash pilot lost his way... History, flying, units and many pictures, including color and profiles by Bob Block. (BS200026) The Spitfire Mk.IX was only used by the Belgian Air Force for seven years. A history including the pre-service life with Cogea Nouvelle and the warbird scene. Detailed profiles by Bob Block. Limited edition. (BS200025) The Gloster Meteor F.4 went into service during 1949 and was the first jet-fighter for the Belgian Air Force. History, flying, units and many pictures (including color. Profiles by Bob Block. Limited edition. (BK200023) A lot of Belgian military aircraft have been painted in special colors due to anniversaries, the Tiger Meet, hours flown or what-ever reason one could come up with ! From F-16 to Hercules, Fouga, S-58, Mirage, Alouette, Alpha Jet etc. (BK200022) For 40 years, the Marchetti has been used by the Belgium Air Force for initial pilot training accumu-lating 300.000 flying hrs. Pictorial book, with history, demo pilots and teams, aircraft in service, accidents & incidents, technical data, walk-around etc. (BK200024) The most comprehensive story on the Fouga Magister in the Belgian Air Force ever ! Details on history, "the Red Devils", other demo-pilots and teams, the aircraft in service, accidents and incidents, technical data, a photographic walk-around of the Fouga and much more. (BK200017) A survey of all aircraft types that have been in use in Belgium since the Second World War; Belgian Air Force, Army, Navy, Air Cadettes and Police as well as the Force Publique in Belgian Congo. Registration review with c/n, date in/out, codes etc. (BK200021) Valkenburg started to be used by the enemy first ! After the War Valkenburg airfield became the major airbase for the Dutch Naval air service (MLD). An illustrated listing of all Foreign military aircraft known to have visited Valkenburg throughout the years including background nformation. 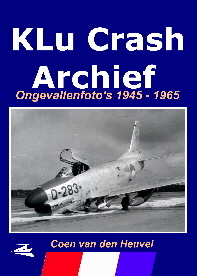 (BK200015) The sequel to KLu Crash Archief, this time accidents and incidents within the Dutch Air Force from 1965 up to 1974. The book describes incidents of the Thunderstreak, Hawker Hunter, Alouette III, Super Cub, Friendship, Beaver, T-33, S.11, NF-5 Freedom Fighter and of course the unforgettable Lockheed F-104G Starfighter. Bird-strikes, flat tyres, collisions, ricochets, take-off and landing-incidents and "total loss" cases. (BK200001) Every single aircraft in use with the Dutch Air Force since 1945 has been dealt with in detail. With registration, c/n, month&year in service, month&year out of service, CofA number, and final fait of the aircraft or current position. 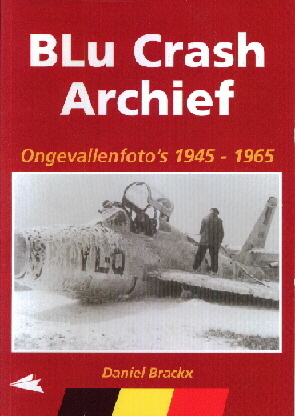 (BK200016) Belgian opponent of "Klu Crash Archief"... as also in Belgium accidents did occur!. Lesser known types like the Sycamore helicopter, Hurricane, Proctor, Tiger Moth, Stampe, Packet, Avro Canuck of the Belgian Air Force are handled alongside the "normal" Thunderstreak, Hunter etc. Most pictures have not yet been published. 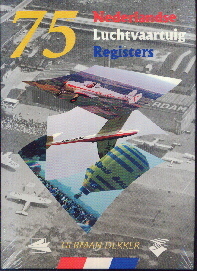 (BK200011) The Ultimate book on the Dutch civil register throughout the years. Including the first, second and current register, gliders, ultralights, reservations, test registrations, semi-military registrations and the like. It's just complete! Included are of course many pictures most not yet published before as well as copies of important documents. The book has been written and compiled by Herman Dekker, who is valued for his knowledge on this subject. Don't let valuable information get lost ! Donate or lend your private collection, logbooks, picturebooks/albums etc to instancies like the Sectie Luchtmacht Historie, Den Haag or the Aviodrome Lelystad, or similar instances in your country. Wij will gladly offer you help in this. Too many times in the past, valuable or nice-to-know information, pictures, stories, documents ended up in the litter! Don't let that happen ! Sinds 1960 is de Koninklijke Luchtmacht verplicht een Luchtvaartuigregister bij te houden zoals ook bij de burgervliegtuigen het geval is. Op dit moment zijn er ruim 1500 vliegtuigen ingeschreven geweest of staan nog ingeschreven. Dit kleine boekje geeft een overzichtslijst en meer bijzonderheden over dit register. For years now, we are compiling a complete review of the Luxembourg civil register. 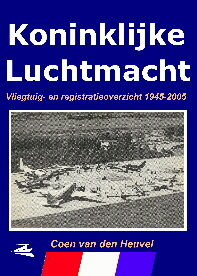 Twenty years ago a book was published on Dutch Super Cubs. Since, we have gathered an amazing amount of new information on this subject and we go in deeper at the use of the Super Cub. More on this subject can be found at Super Cubsvan informatie boven tafel gekomen. - pictures and even snapshots. As good pictures are hard to find in fact every picture is valuable to us.